Welcome to Kayak Agua Fresca! 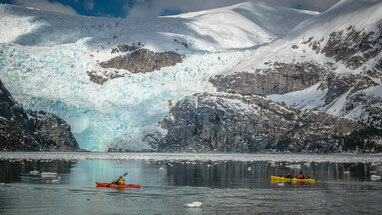 Sea kayak shorexcursions at the Magellan Strait, half or day soft adventure, not previous experience needed. 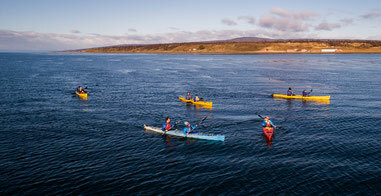 Sea kayak expeditions by the Straits of Magellan and the austral fjords, between 2 and 5 days of duration. This is an adventure for true nature lovers who have experience in sea kayaking and knowledge of camping in remote areas. 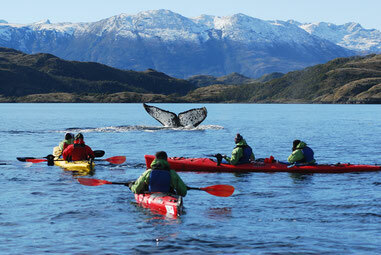 Sea kayak expeditions to Francisco Coloane Marine Park and Tierra del Fuego, from 1 to 4 days of duration, with modality Mothership in a soft adventure. Zodiac boat excursions exploring the Strait of Magellan, visiting places such as Cape Froward. Wildlife watching such as dolphins and sea lions. Hike south of Punta Arenas, in places of historical relevance such as Mount Tarn, visited by Charles Darwin, horseback riding along the coast of the Strait of Magellan. Kayak Agua Fresca, a company based in the city of Punta Arenas, offers sea kayak tours, shorexcursion or day tours, as well as expeditions, horseback riding and trekking through the Strait of Magellan, Southern channels and Tierra del Fuego (Fire Land). The tours or shorexcursions are ideal for people who have little time souch as cruise passengers and people who are looking for an activity to occupy their free time in Punta Arenas. Sea kayak Expeditions that are longer in duration with Mother ship support boat or with minimum support in a more adventurous format, these expeditions are realized in Francisco Coloanes Marine Park area in the Strait of Magellan and Tierra del Fuego. Sea Kayak expeditions with Mohter Ship support boat are designed for a passenger who likes soft adventure, which like adventure but always with comfort at hand. We also have expeditions with minimal logistical support that challenge the most adventurous to explore Tierra del Fuego in its most wild and natural way. We have zodiac boat trips such as sailing to Cape Froward and dolphin watching in the Strait of Magellan. 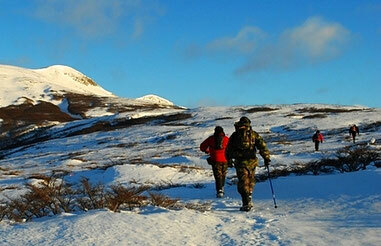 On the other hand we offer trekking or hiking excursions on Mt. Tarn. A famous route that naturalist Charles Darwin did during his visit to this area in the Beagle, and Captain Fitz Roy.